Most retro gamers agree that there was an overabundance of baseball games that occurred during the 8-bit days. I attribute the glut to the Japanese fascination with the sport, though they also must have been easy to develop. Why else would America have received four Bases Loaded, three R.B.I. Baseball titles, and God knows how many others for the NES? I personally have played a couple dozen baseball games since I’ve started my review quests. Most were on the NES, but Sega’s put out their fair share on the SG-1000 and Master System, and I suspect there are dozens more to come. 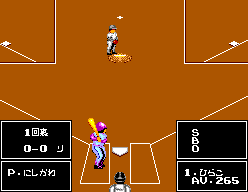 Today’s platter consists of Nekkyuu Koshien or, as it’s known in English, ‘High School Fastball.’ Yes, Nekkyuu Koshien is a high school baseball game, the first I’ve ever played and the first for the Master System. What does that mean exactly? High school teams from everywhere in Japan (I played as Hokkaido West), goofy anime sequences between hits, and hirakana/katakana galore. These sequences are the best portions of the game. What Nekkyuu Koshien has going for it is presentation. You’re able to pick from 49 (!) different high school teams. When you get a hit or score a point, your team’s cheerleaders pep you up with creepy, suggestive routines (I thought this was cute until I realized they were likely underage). 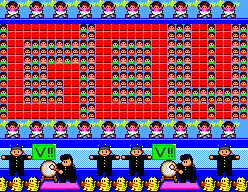 The shrill voice modulation made famous in Alex Kidd: The Lost Stars returns here to yell “Out-o!” or “Saf-u!” among other abrasive words. These are the few touches that make Nekkyuu Koshien distinct. The mice seem pretty happy. But as for the baseball itself, Nekkyuu Koshien could be Bo Jackson Baseball or Great Baseball or any number of middling baseball games. Hitting and pitching feel good enough, but you aren’t able to do much with either. For pitching, I could only throw curveballs and straight forward balls. Perhaps there were more styles, but these were the only two I found (you pitch and swing with Button I – Button II does nothing). My batters were ok, but nowhere near the strength of the opposing team’s batters. I got some hits, mostly singles, then I’d usually get out because sometimes my team wouldn’t run to different bases if I scored a hit. No joke: if I got a single hit with a man on first, I had to move the man on first to second base manually with the controller, while the current batter ran to first automatically. I’ve never seen any other baseball game do this. 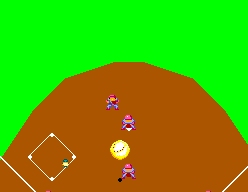 Even in Nintendo’s Baseball, the players on the other bases move when someone scores a run. The less said about my outfielders, the better. If the opposing team hit a ball that ended up being an out, the outfielders would stand in place and catch it, as they should. But Lord help them if the ball went anywhere other than their mitts. The slow pace at which these hooligans moved is only rivaled by the outfielders in – once again – Baseball. All of this being said, I didn’t find it impossible to sit through a full nine innings, but I was nonplussed through most of the game. For the love of crumb cake. Catch the ball! Perhaps I’m being too hard on what are essentially high schoolers trying to ganbatte through some good ol’ fashioned Japanese yakyuu. Unfortunately, Nekkyuu Koshien really is just another baseball game amidst an overcrowded sea of tobacco-filled spittoons. Sounds very strange even by Japanese standards. The controls sound very frustrating. I think you’ll have a better experience with the next baseball game you’re set to review. I was expecting Golvellius presume you just wanted the sports game out of the way before you get to the good stuff, the aforementioned Golvellius, R-Type, Ys and Double Dragon looking forward to the reviews of that bunch. Sounds like a fun bunch. I’m already enjoying Golvellius a good deal. SPOILERS! I saw that upcoming lineup. A bunch of great games. SFC blows both MD and FC out of the water as far as the number of baseball games goes. I researched it a while ago for fun, and the number was really startling. 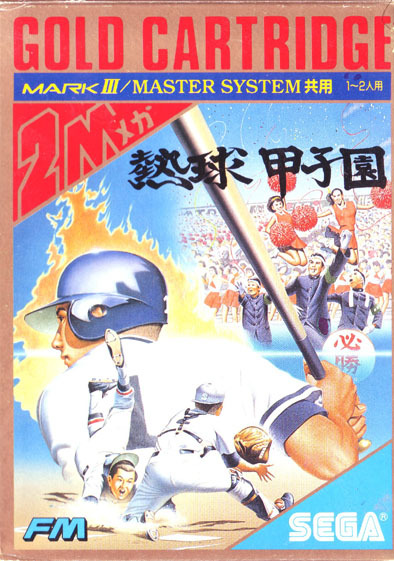 By the way, inexplicably the majority of baseball games came out only in Japan, both for the FC and SFC.